This is not a ladybug – it’s an Asian lady beetle. I no longer have to worry about the sick looking bugs crawling on my walls* and hiding behind snowmobiles. They aren’t sick. They never had that vibrant red I remember ladybugs frolicking in the green grass all summer having. They aren’t pale from a poor diet or lack of sunshine. They aren’t the traditional ladybug. They are a different variety. An ugly variety. They may be alright with their orangeish brown shell and faded spots, but I’m not. * No infestation here, just one lost beetle, don’t be scared. I’m almost sure I’ve never seen a real live official purebred ladybug. It’s always been those Asian beetles. Probably…? I’ve seen both purebreds and Asian beetles. The purebreds are definitely more impressive in the vibrancy of color department than the their overseas cousins, but seeing as how the cousins seem to have completely moved in on their purebred relatives’ home territory, I’m not always a big fan. They’re kind of the National Lampoon’s cousin Eddie of the beetle family. I have a much more casual relationship to the Asian cousin than I do with the purebred. I read that as “magically cute” first. Then I realized that was impossible. You know better. My mind must be on magic shoes. cr, that really makes me wonder what possible kind of relationship you could have with any kind of bug. The most magical part about those shoes is that they still grace my feet everyday. 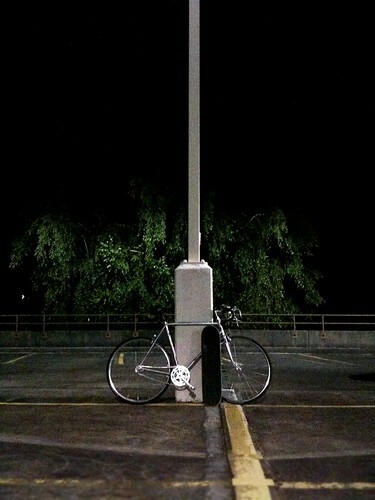 Skateboards and bikes are better at nights. 0 comments.